Aqours - Yuuki wa Doko ni? Kimi no Mune ni! 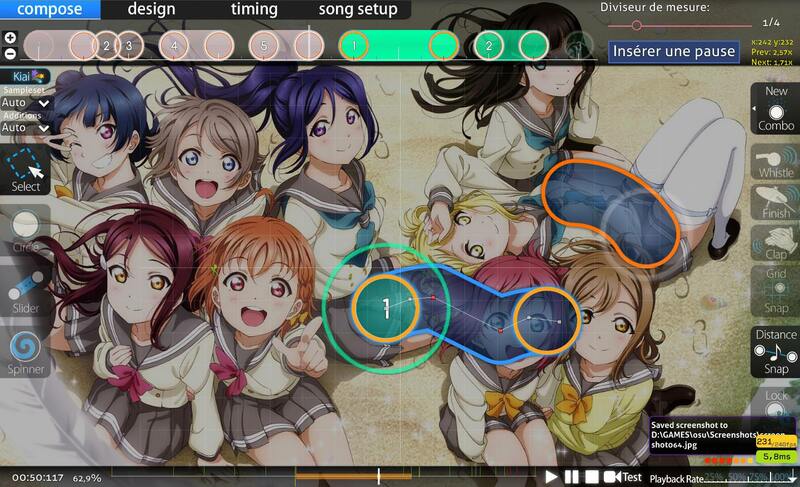 (TV Size) [Taiko · forums · community | osu! this diff needs a lot of polishing and work =/ try to work on the visual spacing stuff and maintaining similar angles between objects so they look like they work together better i'll work on it, thank you again ! Title:Yuuki wa Doko ni? Kimi no Mune ni! 00:46:524 (2,3) - make them aligned ? 01:08:081 (2,3) - it's me or it's not aligned ? 00:52:273 (1,1) - maybe blanket these better ? 00:51:554 (1) - pourquoi pas varier entre 2 sv tout les 2 slider pour un peu mieux reflecter la musique ? 00:55:416 (3) - pq ta pas ajouté un triple ? les sons similaires sont mappés avec des triples, la consistance 00:56:045 (5,1) - n'est pas une vraie justification parce que le son est un peu different avec l'importance du son à (1). the sv seems wayy too low for me with these screen jumps, plz raise it to 2,40. it would avoid a lot of unnecessary slidersbreak here. i don't mod this this because there is nothing to polish but i feel that your patterns are really random and the placement/shape of the sliders are "unorganized". you should practice more how the extras are constructed by watching in the editor some of them and mapping more insane/extra to improve more at mapping them. 00:03:051 (1) - Pretty Ambiguous spacing. Reduce the distance or either increase it so it would make a dash. 00:15:806 (1) - I don't think this part needs to emphasize. Otherwise, 00:16:524 (3) - needs to be emphasized because the vocal voice is strong. 00:28:201 (3,4) - Don't make 00:28:201 (3) - horizontal slider. Tilt in to a bit vertical so you can reach 00:28:560 (4) - without dashing. Thought I don't know which part is being emphasized at 00:28:201 (3,4) - because I hear nothing strong. And yes, some of unexperienced players may miss in that section because of sustainable dash. 01:13:650 (1) - Flip this and move to x:128. Flows well! Gimana kalau 00:10:955 (6) - di flip aja? Daripada buat 1/1 Hdash kayaknya enggak cocok + ini antiflow. Malah ganjel rasanya di gameplay. 00:41:853 (2) - Disini ngerasa ganjel. Di lirik "Aruyo" (Atau apalah itu). A nya start di 00:42:033 - yang harusnya di emphasize, ini malah tidak di emphasize. Saran sih, ganti ke pattern yang memungkinkan untuk emphasize part yang itu. Walaupun sepertinya ngikutin suara drum. Tapi vokal disini kayaknya yang jadi pusat perhatian. Jadi beberapa orang malah merasa ganjel disini. 00:51:733 (5,1) - Bagian ini sepertinya lebih cocok dibuat Hdash. Mungkin bisa flip 00:50:656 (1,2) - terus pindah ke x:304. 00:51:374 (1,2,3,4,5) - Agak dicembungin dikit, flip, terus pindah ke x:336. 00:51:913 (1) - Ini ke x:48 terus agak dimiringkan keatas biar agak gampang ditangkap dan emphasizenya bisa pas. 00:52:991 (1,2) - Ini dibuat Hdash sepertinya bisa juga. Karena ada kemiripan dengan 00:51:374 (1,2,3,4,5,1) - . Mungkin bisa ditambahkan jarak antar kedua slider. 00:10:955 (6) - Need more opinion. 00:25:865 (4,1) - Ane rasa cocok dibuat HDash buat ngikutin suara "dum" nya. 00:41:853 (2) - Need more opinion karena ane rasa itu opini. Ya, ane emang ngikutin drum sih biar tidak monoton ngikutin vocal. 00:52:991 (1,2) - Ane rasa ga pantes dikasih HDash, jadi ane keep. The spacing in the intro is all over the place. Like 00:17:961 (3,4,1) - this for example. There's nothing really to indicate that you need a big gap from 4 to 1. It might play fine, but visually it doesn't look very good. Also, the way you made some of your streams are really strange. 00:31:793 (1) - This 1/1 slider doesn't fit well here. I see the sound you're mapping to but I think a 1/2 slider would fit better because there is a beat 00:31:973 - here. 00:32:691 (3,4,5,1) - Here is another place the spacing is just weird. 01:03:230 (7,8,1) - Not sure what's going on here. You have the triple and then the player just stops right after although there's a guitar playing 01:03:590 - here. 00:51:733 (2) - why do you have this slider head silenced? Last edited by Crypthesis January 18, 2018 at 3:50:50 PM GMT , edited 1 times in total. 01:02:871 (6) - why placing a kickslider here ? it's the same part as the precedent section at 00:59:099 (1) - you can hear theres a triple sound there, but imo its not intense enough to be clickable as a triple, so added a kickslider. 00:12:392 (4,5) - ctrl+g gives more emphasis to 1 no, just plays oddly imo, so i rather not. 00:21:913 (1,1,1) - what are you emphasizing here :l the drums duh, and if you think 'why cant you place circles then?' then try to replace em and play it yourself, not sure how to describe but the difference between using circles and 1/8 sliders is why im using this. 00:49:308 - there's a drum here as you might have noticed how i placed the rhythm and consistently designed slidershapes for this section, you COULD guess that im focusing on vocals which i dont want to interrupt for drums i dont even hear because the vocals are so strong. 00:31:254 (6,7,8) - imo i think the jump is too spiked, there wasn't any build-up in the song that can clearly emphasize the jumps. I'm going to assume that most of the general things have already been taken care of. Nice diff. I'm going to be one of the first people to full mod this. A minor annoyance is 01:07:542 (2,4) -. Kept getting 100s here but you can rank it if you want. Map is pretty fun, I will also be full modding this. 00:14:548 (1,2,3) - IMO this felt weird to play after playing 00:11:674 (1,2,3) -. 01:01:075 (2,3) - You shouldn't stack here IMO since the other parts ( 00:58:200 (2,3) -, 01:03:230 (6,1) -, and 01:03:949 (2,3) - ) aren't stacked. 01:07:542 (2) - Only miss I got when I played DTHRFL first try. Might be better to just remove the repeat at 01:06:823 - and make 01:07:182 - a slider. Plays fine to me. I DTHRHD'd this with no problems. 00:54:787 (1) - This slider was pretty weird when I played it (especially with HR), try moving things around a bit. Plays fine to me. Had no problems with HDHR here. 01:14:736 (1,2) - I'm going to be that guy and say that this should be a slider instead. Kept getting 100s here. Some of the harder diffs already use sliders there so I don't see why you'd want to make Hard easier to get 100s in than Insane+. No problems with HDHR here. 01:12:033 (1,1) - Rankable but definitely feels weird to play after 01:09:159 (1,2,3,1,2,3,4) -. IMO CS3.8 or higher would be better here. CS3.7 feels HUGE even with HDHR. I really liked 00:30:356 (1,1,1,1,1) - and 00:51:913 (1,1,1,1,1,1,1) - but 00:21:913 (1,1,1) - and 00:51:195 (1,1,1,1) - are completely out of place. I personally wouldn't rank this. Regular circles here would be just fine. 00:50:297 (1,3) - These objects are a bit too close to my liking. Doesn't look easy to change though. 00:55:506 (1) - Slider here could be better. It felt rough while I was playing it (especially with HR). 01:15:986 (1) - Any reason why this isn't just a circle like the other diffs? Very fun (and easy?) to HDHR. 00:43:291 (3,3,3,3) - I'm going to be nitpicky and say that these slider tails don't match up. Nothing else to say. Nice diff. Seems a bit too easy for an Extra. I had no problem playing it with HDHR, but some parts need work. 00:32:692 (1,2,3) - The jump here is way too big. I wouldn't rank this. Would play a lot better if you made it 3.1x like what you did with the circles at 01:07:183 (1,2,3) -. 00:48:141 (4,5,6) - This section needs work. It isn't natural to play at all. 00:51:913 - This entire section is just trying to increase the star rating. It's way more difficult than the actual map, which should never happen. Small difficulty increments are fine but this feels like an entirely different map. Either decrease the spacing or make the entire map harder. Definitely playable with HDHR, but lower CS would certainly help. 00:34:039 (4,1,2,3,4,5,6,1) - Personally not a fan of this. It's a pretty difficult pattern for a rather quiet part of the song. 01:06:284 (1,2) - I wouldn't rank this jump. Other ~4.5x jumps like 01:07:362 (2,3) - and 01:00:356 (7,1) - are fine since they give you time to recover with a slider, but this jump is just ridiculous at 4.6x. Try using 4x instead. That's it! Seems pretty good overall. I'd rank it. Missing video in easy, normal, adv, hard, light ins, ins, ins2, xtra, yume, cup, salad, platter, overdose fixed ! 00:25:506 (3,4) - make ur spacing consistent with 00:24:069 (3,4) - since they didn't have difference in intensity yeah, i wasn't sure about that when i did it xd, fixed ! 00:55:326 - unsilence this don't know why i silenced this, thank you ! 01:01:075 (2,3) - You shouldn't stack here IMO since the other parts ( 00:58:200 (2,3) -, 01:03:230 (6,1) -, and 01:03:949 (2,3) - ) aren't stacked. Fixed ! 01:07:542 (2) - Only miss I got when I played DTHRFL first try. Might be better to just remove the repeat at 01:06:823 - and make 01:07:182 - a slider. Better now, thanks ! 00:43:291 (3,3,3,3) - I'm going to be nitpicky and say that these slider tails don't match up. I wanted to change the slider shape few days ago but i had no idea xd, i changed it and i find them better now, thanks ! Thank you for the mods and for good things you said about my diffs, it helps a lot and encourages me ! 00:15:806 (1) - I don't think this part needs to emphasize. Otherwise, 00:16:524 (3) - needs to be emphasized because the vocal voice is strong. I'm emphasizing it due to both it being a particularly strong vocal, and I'm not emphasizing that one you mentioned due to it being quite inconsistent with dashing density. Last edited by Mitsuna- February 1, 2018 at 7:03:20 PM GMT , edited 1 times in total. 00:10:057 (5,1,2) - unrankable perfect stack. and anyway i think this pattern is quite confusing for a new player Fixed~! 00:15:626 (4,1) - uhhhhhhhhh the slider end of 4 is so strong and 1 doesn't follow the most obvious vocal line. how about replacing 4 with a circle and move 1 to the red tick Fixed~! 00:10:057 (5,1) - seems confusing for me and could be hard to read, you introduce stacked 2/1 circles + slider but here you put 2 circles instead. the really low stack leniency doesn't help. they could be manually stacked (with 0,1x ds) or just unstacked which i recommand to use Fixed~! 00:00:177 - Make the volume level of green and red line the same Fixed~! 00:54:787 (1) - This slider was pretty weird when I played it (especially with HR), try moving things around a bit. Fixed~! Title:Yuki wa Doko ni? Kimi no Mune ni! i have no clue what your intro rhythm (before 6s or so) is following, try to focus either on the vocals more closely or on the background repeating guitar..
00:12:392 (3,4) - ctrl g for vocals? this goes for the entire kiai part lol..